To decrease the morbidity of nephroureterectomy, various endoscopic methods have been described for the management of the distal ureter and the bladder cuff. McDonald et al. 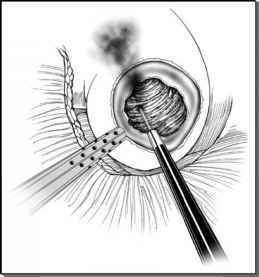 (1953) first described the "pluck" technique in which the ipsilateral ureteral orifice was resected via a transurethral approach (8). Once the distal ureter was disconnected from the bladder, the bladder defect was fulgurated. The nephrectomy portion of the surgery was then performed in an open fashion via a flank or subcostal incision, and the disconnected ureter was "plucked" out together with its bladder cuff. Because the distal ureter, which is resected, is left open, the "pluck" method has been criticized for tumor seeding in the retroperitoneum, which has been documented (9,10). For laparoscopic nephroureterectomy, numerous methods have been described for the management of the distal ureter, all with a goal to achieve a minimally invasive technique while not compromising the oncologic efficacy. These techniques each present with their advantages but also with their shortcomings.